Comillas University has recently finished for the MonitorX project a review report on analytics methods supporting anomaly detection and Condition-Based Maintenance (CBM). The report describes the main steps in the process from components, failures and condition monitoring data via fault diagnosis to CBM. The main structure of the report is illustrated in Figure 1. The aim of condition-based maintenance is to carry out maintenance when the condition of the components indicated the need for maintenance. Intelligent analysis of condition monitoring data shall help to detect faults before they lead to breakdown of the components and to catastrophic failures. The aim of fault diagnosis is to determine the kind, size, location and time of a fault. 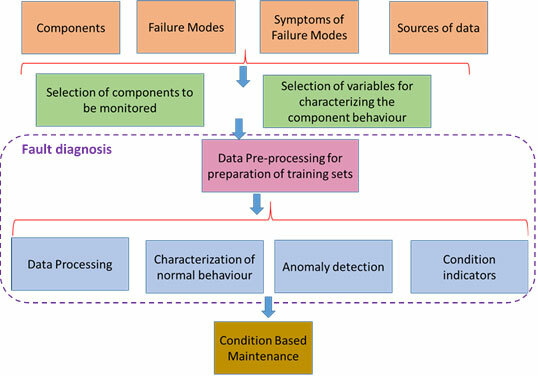 Figure 3 shows a general scheme of the fault diagnosis process consisting of two main steps. The first step is performed by the fault detector whose task consists of acquiring data and elaborating proper information to be given for the second step. The outputs of the fault detector are called symptoms, i.e. information of the changes of an observable quantity from the normal behaviour. Therefore, the fault detector is a unit performing data processing in order to extract useful information about the fault it is detecting. A second step is required to complete the fault diagnosis. 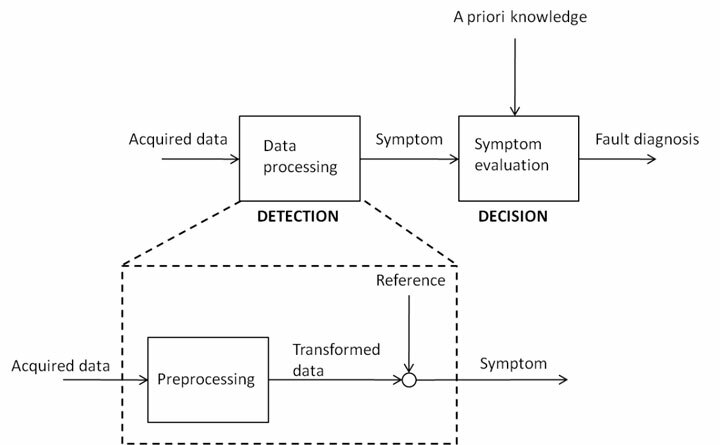 This second step consists of the decision as to whether or not a fault has occurred and determining the fault’s characteristics on the basis of the information processed by the fault detector and some a priori knowledge of the process such as deep knowledge of the physical processes involved and their general condition, operational and/or maintenance constraints or environmental considerations. What the decision system is supposed to realize is an automatic association between symptoms and faults. The report presents a brief overview of data pre-processing methods and a more comprehensive review of methods used for fault detection and fault diagnosis. Some of the methods described in the report and illustrated by a number of examples in the report are physical models, statistical models (principle components analysis, linear regression), neural network models (feedforward neural networks and self-organizing maps), models of data classifiers based on information entropy reduction (K-Means, hierarchical clustering, decision trees, support vector machines) and fuzzy models.